Good morning, I woke up with the message: Stop Doing Just Enough. How many times in your life can you say you were doing just enough to get by??? I have to be honest for the last 8 years in my business that has been me. I was not concerned with what the future holds, because I thought everything was okay. NOW I KNOW that doing just enough will cause your entire LIFE to crumble. I am telling you and myself. 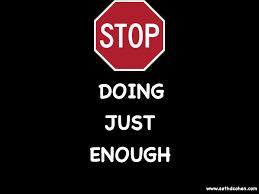 STOP DOING JUST ENOUGH!!!! Today is the day to affirm that I will do more than I ever imagined to change my life. Commit to yourself that you are worth everything that life has to offer. I am sure if you commit, you will go into action and change your life. I have made some incredible goals for 2015. It requires me going into great action to make that happen. Today is the day: STOP DOING JUST ENOUGH!!! !